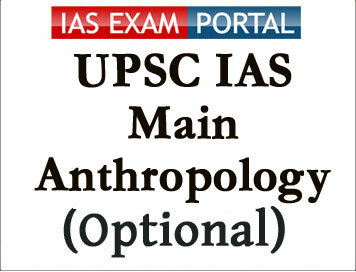 Suggested Reading for Civil Services Mains (Optional) Examination: Anthropology | IAS EXAM PORTAL - India's Largest Community for UPSC Exam Aspirants. Q. 1. I was planning to opt Anthropology but feel quite apprehensive after revision of its syllabus. Can I manage the new syllabus ? Ans. The syllabus, despite the best efforts of UPSC and its coterie of experts, has become more scoring. This is more true if you had been targetting biological anthropology portion. If you were inclined to opt for anthropological thought (hitherto section II-B), you shall have to make slightly greater efforts to score as much. Now scoring over 400 marks may not be too difficult. 8. Applications of Biological Anthropology in a nutshell, there is no denying the fact that the syllabus has been revised but much of it seems to have been done to check the ever-growing popularity of the subject. Now judge yourself whether it is manageable or not . Q. Anthropology is quite new to me. How should I go about it ? Ans. Like every new subject, the first thing to do is to understand fundamentals including terminology. A good Dictionary of Anthropology (e.g. McMillan’s) and basic books (e.g. Haviland or Ember & Ember & NCERTs) should be really helpful. Further preparation with the help of books (given in the table) should not pose much problem. Besides, if you feel the need, you can seek the study-material from a coaching institute. Q. Does Anthropology require a special strategy to score well in the exam ? Ans. Not in the real sense; but realising the fact that Anthropology, by its origin, is oriented scientifically, the answers should be pin-pointed and to the point. For this you should have good practice of writing answers and getting evaluated from some-one who not only knows the subject but also understands the requirements of this particular exam. Otherwise, you seek the advise from ten persons and you will, more likely, encounter eleven opinions. Q. What is your last word about the new syllabus ? knowledge, opting Anthropology as second optional for Mains is not a bad bargain.